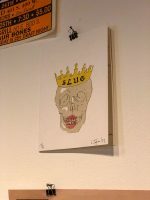 For the past 30 years, SLUG Magazine has been an institution of Salt Lake City’s underground culture and written publication scene. With its once-a-month print publication distributed for free, SLUG Magazine has been able to publish and show the goings on with the food, music, live events and art culture of Salt Lake City. Executive Editor Angela Brown describes what has allowed SLUG to thrive for the past 30 years. SLUG’s 30 Years Under the Influence event showcase is being held at the Utah Museum of Contemporary Art. 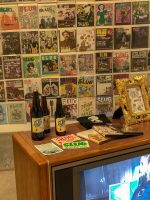 This showcase shows the history of SLUG through memorabilia and covers from each month’s printed issue from the past 30 years. 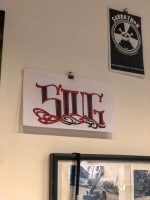 The goal of the showcase is to not only show the history of SLUG, but also show the lasting impact it has had on the Salt Lake City underground scene. With the issues being free to the public, SLUG relies solely on ad revenue to provide their budget for publication. Brown’s words show how much value certain business’ place on SLUG by choosing them to advertise with rather than going for a larger print publication. 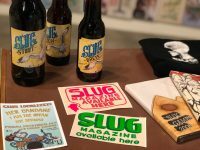 With the success SLUG Magazine has had for the past 30 years, it’s clear that with the underground community of Salt Lake City still wanting more, the publication should see another 30 years of success as well. The 30 Years Under the Influence exhibit will be open at the Utah Museum of Contemporary Art through Oct. 20. “SLUG Retrospective: 30 Years Under the Influence” is on display at the Utah Museum of Contemporary Art. 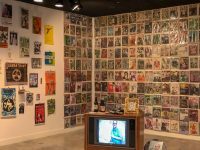 The exhibit, which opened June 22, 2018, explores the three-decade history of the magazine. 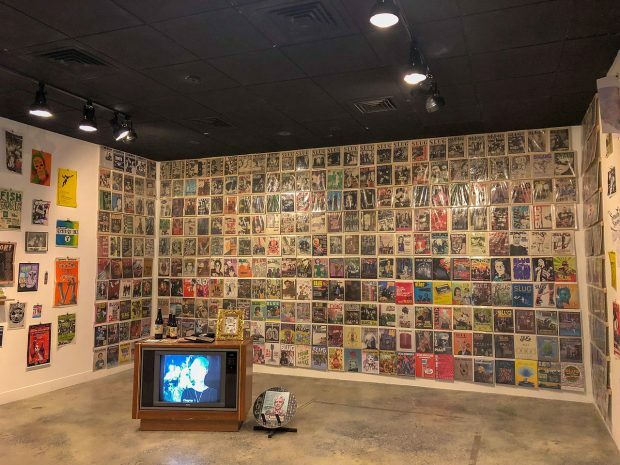 An assortment of magazine covers line the walls of the “SLUG Magazine: 30 Years Under the Influence” exhibit at the Utah Museum of Contemporary Art. 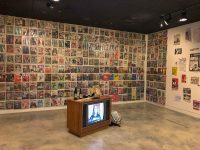 An assortment of magazine covers line the walls of the “SLUG Magazine: 30 Years Under the Influence” exhibit at the Utah Museum of Contemporary Art. The exhibit will remain open through Oct. 20. 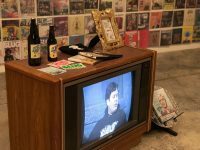 A number of pieces of SLUG memorabilia sit on a vintage television inside the “SLUG Retrospective: 30 Years Under the Influence” exhibit at the Utah Museum of Contemporary Art. The exhibit looks back at the three-decade history of the independent magazine. 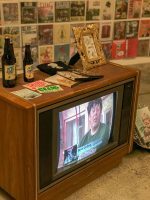 The “SLUG Retrospective: 30 Years Under the Influence” exhibit at the Utah Museum of Contemporary Art contains various pieces of memorabilia produced throughout the three-decade history of SLUG Magazine. The exhibit will remain open through Oct. 20. A vintage television plays SLUG Magazine videos inside the “SLUG Retrospective: 30 Years Under the Influence” exhibit at the Utah Museum of Contemporary Art. SLUG has been covering the underground scene since the late 1980s. Salt Lake Underground memorabilia sits on display inside the “SLUG Retrospective: 30 Years Under the Influence” exhibit at the Utah Museum of Contemporary Art. 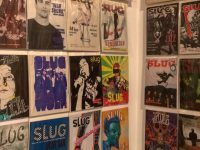 The exhibit looks back on the three-decade history of SLUG Magazine. 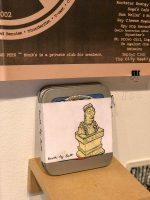 A “Slug Life” painting sits next to other SLUG Magazine memorabilia inside the “SLUG Retrospective: 30 Years Under the Influence” exhibit at the Utah Museum of Contemporary Art. The exhibit will remain on display through Oct. 20. 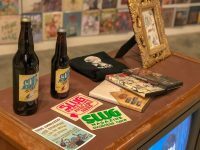 SLUG Magazine stickers, beer bottles and videos sit on display inside the “SLUG Retrospective: 30 Years Under the Influence” exhibit at the Utah Museum of Contemporary Art. The free publication has been covering the underground scene since the late 1980s. SLUG Magazine videos play on a vintage television inside the “SLUG Retrospective: 30 Years Under the Influence” exhibit at the Utah Museum of Contemporary Art. The exhibit looks back at the three-decade history of the independent publication. 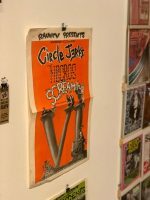 A vintage concert poster hangs on display inside the “SLUG Retrospective: 30 Years Under the Influence” exhibit at the Utah Museum of Contemporary Art. 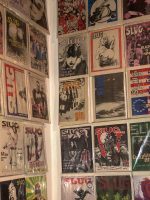 SLUG started out primarily as a punk-rock culture magazine. Skull artwork created for SLUG Magazine hangs on display inside the “SLUG Retrospective: 30 Years Under the Influence” exhibit at the Utah Museum of Contemporary Art. SLUG Magazine has been in production since the late 1980s. Graffiti artwork for SLUG Magazine hangs on display inside the “SLUG Retrospective: 30 Years Under the Influence” exhibit at the Utah Museum of Contemporary Art. The exhibit features a comprehensive collection of items from the magazine’s three decades of publication. 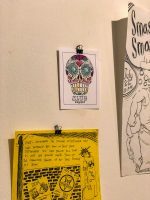 A skull design for SLUG Magazine hangs on display inside the “SLUG Retrospective: 30 Years Under the Influence” exhibit at the Utah Museum of Contemporary Art. The exhibit showcases a collection of artwork and other memorabilia from the magazine’s three-decade history. 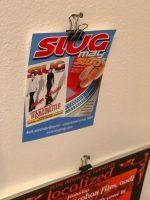 An old advertisement for SLUG Magazine hangs on display inside the “SLUG Retrospective: 30 Years Under the Influence” exhibit at the Utah Museum of Contemporary Art. The exhibit contains three decades of magazine memorabilia. 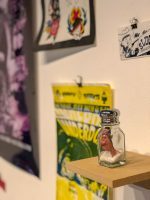 A collection of local music put together by SLUG Magazine titled “Death by Salt” sits on display inside the “SLUG Retrospective: 30 Years Under the Influence” exhibit at the Utah Museum of Contemporary Art. SLUG has covered the local music scene since the late 1980s. 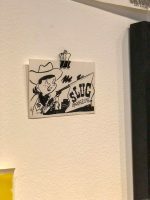 Cowboy-themed artwork for SLUG Magazine hangs on display inside the “SLUG Retrospective: 30 Years Under the Influence” exhibit at the Utah Museum of Contemporary Art. Salt Lake Underground has been in operation since the late 1980s. 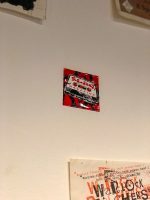 A SLUG Magazine cassette tape sticker hangs on display inside the “SLUG Retrospective: 30 Years Under the Influence” exhibit at the Utah Museum of Contemporary Art. The exhibit contains a treasury of memorabilia collected over the past three decades. A SLUG Magazine entertainment guide and review form 2010 hangs on display inside the “SLUG Retrospective: 30 Years Under the Influence” exhibit at the Utah Museum of Contemporary Art. 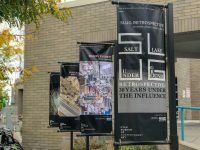 The exhibit, which will be open through Oct. 20, showcases three decades of Salt Lake Underground memorabilia. A clay sculpture inside a salt shaker sits on display inside the “SLUG Retrospective: 30 Years Under the Influence” exhibit at the Utah Museum of Contemporary Art. 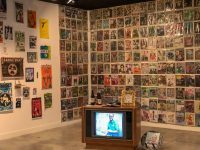 The exhibit is a collection of artwork and memorabilia from the three-decade history of SLUG Magazine. 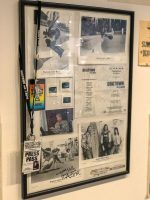 Various press credentials and other papers hang on display inside the “SLUG Retrospective: 30 Years Under the Influence” exhibit at the Utah Museum of Contemporary Art. 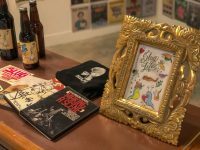 Over three decades, SLUG Magazine has covered a variety of topics, including local music, art, film, fashion, beer, bicycling and action sports. 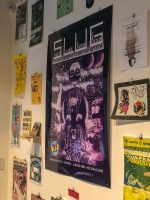 The “SLUG Retrospective: 30 Years Under the Influence” exhibit at the Utah Museum of Contemporary Art showcases three decades of publications and other memorabilia from Salt Lake Underground Magazine. 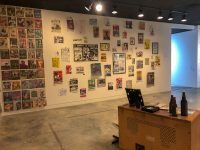 The “SLUG Retrospective: 30 Years Under the Influence” exhibit at the Utah Museum of Contemporary Art takes a look back at the history of Salt Lake Underground Magazine, which first started publishing in the late 1980s. The exhibit will remain open through Oct. 20. 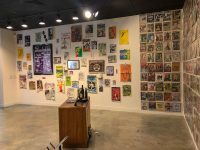 The “SLUG Retrospective: 30 Years Under the Influence” exhibit at the Utah Museum of Contemporary Art showcases three decades of Salt Lake Underground Magazine memorabilia. The exhibit is on display through Oct. 20. A wall of magazines hangs on display inside the “SLUG Retrospective: 30 Years Under the Influence” exhibit at the Utah Museum of Contemporary Art. The exhibit features every issue of Salt Lake Underground Magazine since it was first published. 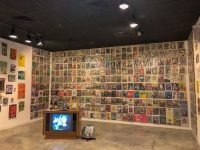 A wall of magazines containing every edition of SLUG Magazine is a focal point of the “SLUG Retrospective: 30 Years Under the Influence” exhibit at the Utah Museum of Contemporary Art. The exhibit will be on display through Oct. 20.